Club Penguin Cheats by Mimo777 Club Penguin Cheats by Mimo777: Mimo's Wicked Snowboard Contest! Remember when I told you about the New Zealand "Winter Wicked Snowboard" contest? It's a pretty smoove contest, but you have to be from New Zealand! BUMMER! But... then I got to thinking... I haven't had a contest in a while, so why not have our own Wicked Snowboard contest? So, here's the deal! You design your own snowboard and email it to me (info@mimo.cc). CPG and Mimo will choose the top 10 designs and let you all vote on the winner! Cool? What does the winner get? Dunno, you tell me. Leave a comment if you have a good idea. Cool :) So, to make sure I'm understanding correctly, can you just draw on a sheet of paper cut into the shape of a snowboard and then scan it onto your computer and send it to the CPG Gang? they should be your buddy on club penguin. Correct! You can also use a computer program to create your design... But it's all up to you! I truley think membership is a good idea. For the winner. You should decide top 10 and we will vote, then whoever wins gets clubpenguin membership! Can we make custom penguins? Oh ya! I'm totally entering! I would may think the prize would be a 6 months membership or having you as a friend. Or I would think may be all the winners get a free brown puffle stuff animal. Heck any prize would be good! I just like entering! Winner should get membership card code... because being your buddy would be kinda hard... You'd be surrounded. Why are you guys expecting so much from Mimo? He doesnt own a parrot that vomits cash...or does he...He'll probably just put your name on a post or maybe if your lucky he'll give away a one month free membership! Mimo, have you noticed in your playercard how you have the puffle whistle now! And when you press on it it'll bring you flare. You have to have unlocked Flare though. First, you design your snowboard-either by using the computer or drawing on a piece of paper then scanning it through your computer. Then email it to the email address Mimo put on the post which is info@mimo.cc. Click 'Send' and you're done! :) I hope you win! Definatly be on your buddy list and maybe a party at your place with the top ten winners!?!? Dood,Mimo ain't made of money. The winner should get an interview with you on Club Penguin. They'd prearrange the questions though. We know. We are joking around. The Winner shlould be Mimo's Friend and get a Treasure book Code. No way! Mimo's not gonna spend a hundred dollars because someone drew a snowboard. He;s not made of money. 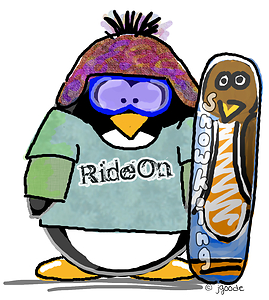 Does the snowboard design have to be based on Club Penguin? And maybe the prize should be a party with Mimo on CP! If you have seen my other post, you would know that we are just joking around! God, stop telling us this! I dont mean to be rude but seriously!